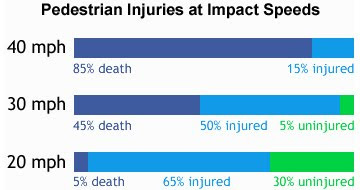 Copenhagenize.com - Bicycle Urbanism by Design: Avoidable Tragedy with 30 km/h Zone? Avoidable Tragedy with 30 km/h Zone? Last night a tragedy took place right down the street from where I live with my children. A mother and daughter were crossing the pedestrian crossing. A car stopped for them but a van didn't fancy stopping and overtook the stopped vehicle on the right. He plowed straight into the mother and daughter without even braking. They were knocked 23 metres down the street. The 10 year old girl died today at the National Hospital. The mother is still in critical condition at time of writing. Tragedies like this are always more intense when they happen in your neighbourhood or happen to people you know. It is quite impossible as a father to NOT think about my own children - 9 and 4 - who also use pedestrian crossings in the same neighourhood. Those thoughts and feelings are something I try to keep private. What this post is about is that this tragedy - and others like it - could quite possibly have been avoided. If it wasn't for the increasingly car-centric attitude that grips Copenhagen and Denmark. This is about 30 km/h zones. Two years ago I blogged about 30 km/h zones for the first time here on Copenhagenize.com. Amazingly, I remain the only person in Denmark who talks about them. 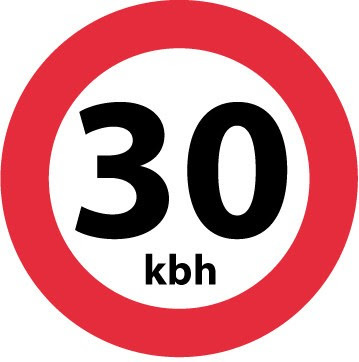 Amazing because we have a great deal of knowledge about the positive effects of 30 km/h zones in urban areas and yet the Danish police and politicians remain silent on the issue. There are many culprits, not least the man who killed the girl and critically injured the mother. He probably won't go to jail for what could easily be considered a murder. He'll be punished, of course, but the punishment will be shockingly inappropriate to the crime. We'll never change perceptions about how dangerous driving is unless people are punished accordingly. Unless driving licences are revoked permanently. The Danish police are also a primary antagonist. They are a constant source of irritation because of their reluctance to change the status quo in the traffic. They do not support lower speed limits, even though the Danish Road Directorate has recommended it. Compared to other police forces in Europe they have little interest in what other cities and police forces are going and they rarely embark on study trips to learn from other experiences in other cities. The politicians in Copenhagen and Denmark are also shockingly silent on the issue of lower speed limits. You need a magnifying glass to find references to them in the press and they are often just passing comments. No serious efforts are made to make our cities safer and to reduce injuries and prevent deaths for pedestrians and cyclists. The Danish Road Safety Council are the automobile industry's best friends. They have had a few campaigns aimed at motorists, including one called "Ta' Toppen af Farten" - something like "Cut Down Your Speed a Bit". They have never gone after motorists in any effective way - never trying to change the perception of driving as normal, merely carrying on the same old, same old status quo. Today I was sitting with my friend from Classic Copenhagen and we were rather outraged that over 70 cities in Europe have implemented 30 km/h zones and yet Copenhagen is doing nothing. Absolutely nothing. The man who killed the girl was doing 60 km/h in a 50 km/h zone. The mere fact that there are 50 km/h zones in Denmark's most densely populated city - Frederiksberg - is an outrage. It came out today that the City of Frederiksberg knew that the location of the tragedy was dangerous. In this article in the national paper Politiken it states that "The City of Frederiksberg has known for a long time that the location is problematic for the pedestrians who try to cross Rosenørns Allé." Last September (2011) the city decided to improve safety at the spot. Their plan? Putting in a wider median between the two crosswalks at the intersection and putting up blinking yellow lights to warn motorists that they are approaching a pedestrian crossing. Did they consider improving safety by listening to the experiences from the rest of Europe by reducing speed limits to 30 km/h? No. A couple of flashing lights in a 50 km/h zone. Letting the parasites roll freely through our city streets. Today we started a Facebook group advocating 30 km/h zones in Copenhagen. We call it 30 kb/h - the kbh is the abbreviation for Copenhagen in Danish. Please pledge your support by joining the group. If you have any other links to studies/articles about the benefits of 30 km/h zones, please add them here to the comments or to the Facebook page page. Here's why 30 km/h zones make a difference. And why this tragedy may have been avoided. This also applies to cyclists, of course.